Chemistry is the science of chemical elements and compounds and how these things work together - for more information see the Beginners Guide to Periodic Chemistry. 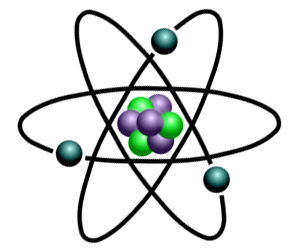 A chemical element contains only one type of atom. If a substance contains more than one type of atom, it is a compound. A compound is a pure chemical substance consisting of 2 or more different elements that can be separated into simpler substances by Chemical Reactions. Chemical substances exist as solids, liquids or gasses (States of Matter). Most elements are solids, only 11 are gases and 2 are liquids. Substances may change between these phases of matter with changes in temperature or pressure. A common example of a chemical substance is pure water. Chemical reactions convert one chemical substance into another. A common example of a chemical substance is pure water. Changes in temperature can change from a liquid (water) to a solid (ice) to a gas (water vapour / steam). Chemical Formulas - What is a Chemical Formula? What is a Chemical Formula? A formula in chemistry is a type of shorthand for representing the elements in a compound. Element Symbols are included on the Periodic Table. Symbols from the periodic table are used for the individual elements. e.g. O for oxygen, H for hydrogen, C for carbon, N for nitrogen, Ca for calcium and Na for Sodium. Substances that have two or more atoms bonded together, and therefore more than one element, are called compounds. See Examples of Compounds. Examples of chemical formulas and their meanings are explained in Examples of Chemical Formula and Equations. This page provides examples detailing how to write a formula or equation together with examples and the use of subscripts. Chemical formulas shows the symbols of the elements in the compound and the ratio of the elements to one another. If a substance contains more than one atom of a particular element, this quantity is indicated in chemical formulas using a subscript number after the chemical symbol. The subscript refers only to the element it immediately follows. For example in formulas and equations, the chemical formula for water is H2O which indicates that 2 atoms of Hydrogen combines with 1 atom of oxygen. The chemical formula for sodium chloride is NaCl indicating that one atom of sodium combines with one atom of chlorine in a one-to-one ratio. Subscripts are added, following the element symbol, to indicate that the number of atoms of that element in the compound if it is greater than one. For example, the equation for magnesium bromide MgBr2 which indicates that one magnesium atom combines with two bromine atoms. The following list shows some of the most common formulas for both elements and compounds.